All games in category "Shooter"
Fantastic Parodius - Pursue the Glory of the Past (極上パロディウス ～過去の栄光を求めて～ Gokujō Parodiusu - Kako no Eikō o Motomete? ), known outside of Japan as Fantastic Journey, is a scrolling shooter arcade game and the third title in the Parodius series produced by Konami. Like the rest of the series, it is a parody of the Gradius series and other Konami games. Gradius III (グラディウスIII -伝説から神話ヘ- Gradiusu Surī: Densetsu kara Shinwa he?, Gradius III: From Legend to Myth) is a side-scrolling shooting game originally released for the arcades in Japan and other parts of Asia in 1989. 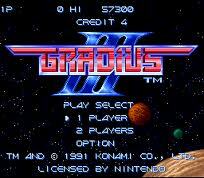 It is the third sequel to the original Gradius for the arcades following Gradius II: Gofer's Ambition, and was followed by Gradius IV: Resurrection. Gradius III was rereleased for the Super Famicom in Japan in 1990, and for the Super Nintendo Entertainment System in North America in 1991 as a video game launch title. 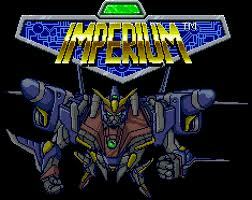 It was released as simply Gradius III (グラディウスIII Gradiusu Surī?). 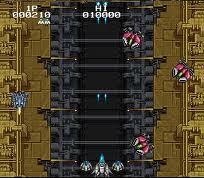 The arcade version was included with Gradius IV in a two-in-one compilation (Gradius III & IV) for the PlayStation 2 and in the Gradius Collection for the PlayStation Portable. The Great Battle V is an Action game, developed by Sun L and published by Banpresto, which was released in Japan in 1995. 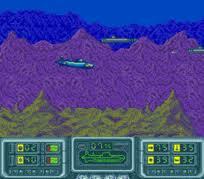 The Hunt for Red October is a video game based on the movie The Hunt for Red October. It was first released in 1990 for the Nintendo Entertainment System. Versions for the Game Boy and Super NES were subsequently released. Jikkyō Oshaberi Parodius (実況おしゃべりパロディウス Jikkyō Oshaberi Parodiusu?, "Chatting Parodius Live"), known on the Sega Saturn and PlayStation as Jikkyō Oshaberi Parodius ~forever with me~ (実況おしゃべりパロディウス 〜フォーエバー・ウィズ・ミー〜 Jikkyō Oshaberi Parodiusu ~fōebā uizu mī~?, lit. 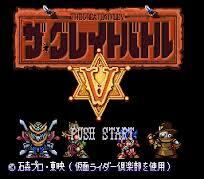 "Chatting Parodius Live ~forever with me~"), is the fourth game in a series of parody shooters produced by Konami. 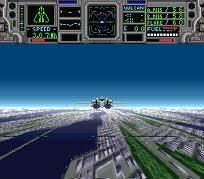 The gameplay is stylistically very similar to the Gradius series, but the graphics and music are intentionally absurd. The game, as its name would suggest, contains a large amount of Japanese voice samples shouted out in a style similar to that of a game show host. 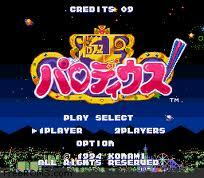 Unlike the previous two titles, Jikkyō Oshaberi Parodius was not created as an arcade game. It was first released on the Super Famicom in 1995 and then ported and updated for the PlayStation and Sega Saturn in 1996. 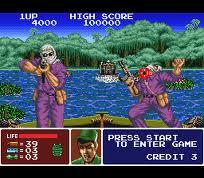 Jungle Strike is a video game developed (in association with Mike Posehn) and published by Electronic Arts in 1993. It was originally released for the Mega Drive, before being ported to several other systems including an upgraded version for the Amiga. The Amiga and other home computer conversions were the responsibility of Ocean Software while the Super Nintendo Entertainment System version was that of Gremlin Interactive. 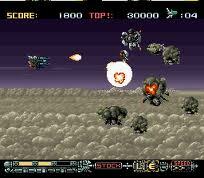 The game is a helicopter based shoot 'em up, mixing action and strategy. It is the sequel to Desert Strike: Return to the Gulf (a best-seller released in 1992) and is the second game in the Strike series. 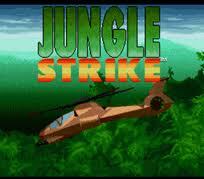 Jungle Strike retained its predecessor's core mechanics and expanded on the model with additional vehicles and settings. The plot concerns two villains intent on destroying Washington, D.C.. The player must use the helicopter and occasionally other vehicles to thwart their plans. The game was critically acclaimed, with some reviewers awarding scores upwards of 90%. Publications praised its gameplay, strategy, design, controls and graphics, although there were some complaints regarding the interface, difficulty and perceived jingoistic politics. The President of the United States in the game is not named, but is apparently modeled after Bill Clinton, who in a cut scene praises the player for protecting him and apologizes for cutting the defense budget. Lethal Enforcers (リーサルエンフォーサーズ Rīsaru Enfōsāzu) is a 1992 shooting game released for the arcades by Konami. The in-game graphics consist entirely of digitized photographs. This caused controversy as it allowed players to shoot photorealistic representations of enemies. Home versions were released for the Super Famicom/Super NES, Sega Mega Drive/Genesis and Mega-CD/Sega CD during the following year and include a revolver-shaped light gun known as the Konami Justifier. 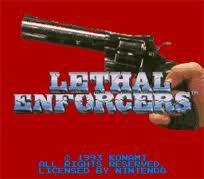 Lethal Enforcers was followed by Lethal Enforcers II: Gun Fighters. Years later, Konami released the Police 911 series as a Japan-themed sequel to the original plot. This was also followed by the arcade game Seigi No Hero, which localized and renamed as Lethal Enforcers 3 for Western audiences. 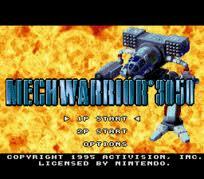 Mechwarrior 3050 is a 1994 mech-based video game developed by Malibu. The first Battletech based game to be released for the Sega Genesis, it was originally titled simply Battletech, but was later ported to the Super NES by Activision as Mechwarrior 3050. The Sega Genesis and Super NES versions are nearly identical, except for their titles.The story takes place during the events of the Clan Invasion in the 3050 era. Players are assigned the role of a Clan Wolf Mechwarrior, who is sent to eliminate several Inner Sphere assets which threaten to destroy the Clan's dominance on the battlefield.This video game is viewed in an isometric view as opposed to the first person view of the previous game. The game also features a two-player mode where one player controls the bottom half of the mech to navigate it around the map while the second player controls the upper torso, which moves independently. Parodius! From Myth to Laughter (パロディウスだ! －神話からお笑いへ－ Parodiusu Da! Shinwa kara Owarai e?, lit. "It's Parodius! From Myth to Laughter"), released outside of Japan as Parodius, is a shoot'em up arcade game and is the second title in the Parodius series produced by Konami. 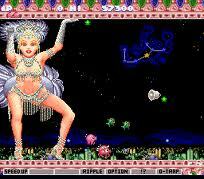 The European SNES version is also known as Parodius: Non-Sense Fantasy. The gameplay is stylistically very similar to the Gradius series, but the graphics and music are intentionally absurd.This game is often mistaken as the original game of the series. The lesser known original game, Parodius: The Octopus Saves the Earth, was released for the MSX computer in Japan. Phalanx is a 1991 space shooter video game developed by ZOOM Inc. and Kemco for the Sharp X68000, Super Nintendo Entertainment System and Game Boy Advance. The game was released for the X68000 in Japan in 1991, for the SNES in Japan on August 7, 1992 and in North America in October 1992, and for the GBA in Japan on October 26, 2001, in Europe on November 23, 2001 and in North America on December 27, 2001.Phalanx is infamous [according to whom?] for the incongruous box art in its American release: it displays a bearded, elderly man dressed in overalls, wearing a fedora and playing a banjo while a futuristic spaceship flies in the background. The popular media site IGN named it their fifth "Most Awesome Cover" in a top 25 countdown on their website. The box art designers later admitted that they had deliberately chosen this theme in order to attract the customer with something original, considering there were many space shooters in the market that looked alike. The Game Boy Advance release redesigned the cover in favor of a prominent spaceship image. 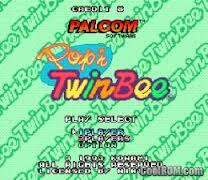 Pop'n Twinbee (Pop'nツインビー?) 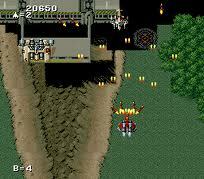 is a top-view shoot-'em-up game originally released in 1993 by Konami for the Super Famicom/Super Nintendo Entertainment System in Japan and Europe. It is the sixth game in the TwinBee and a direct follow-up to the arcade game Detana!! TwinBee (Bells & Whistles). The European version was published by Konami's Palcom Software division and was the first of three TwinBee games localized for the European market, followed by a Game Boy version of Pop'n TwinBee (which was actually an earlier game titled TwinBee Da!! 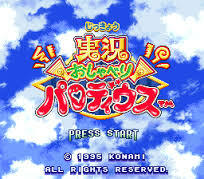 in Japan) and the side-scrolling platform game Pop'n TwinBee: Rainbow Bell Adventures. 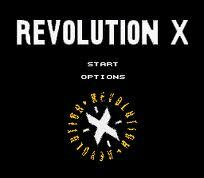 Revolution X is an arcade rail shooter game developed and published by Midway in 1994, featuring the rock band Aerosmith. 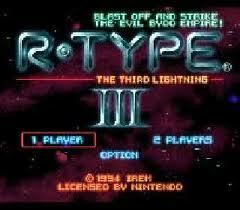 It features gameplay similar to Midway's earlier Terminator 2: Judgment Day. In the game, players battle the oppressive New Order Nation regime and their leader Helga, who have abducted Aerosmith. Players use a mounted gun to control onscreen crosshairs and shoot enemies using compact discs. The members of Aerosmith are hidden throughout the game's international locales and must be found in order to receive the game's true ending. The game was ported to various consoles as well as DOS computers. These ports were negatively received and reportedly dissuaded Midway from making a sequel.